The pathway becomes much more urban by this stage, winding past tall buildings, going under archways and the overhangs of buildings. 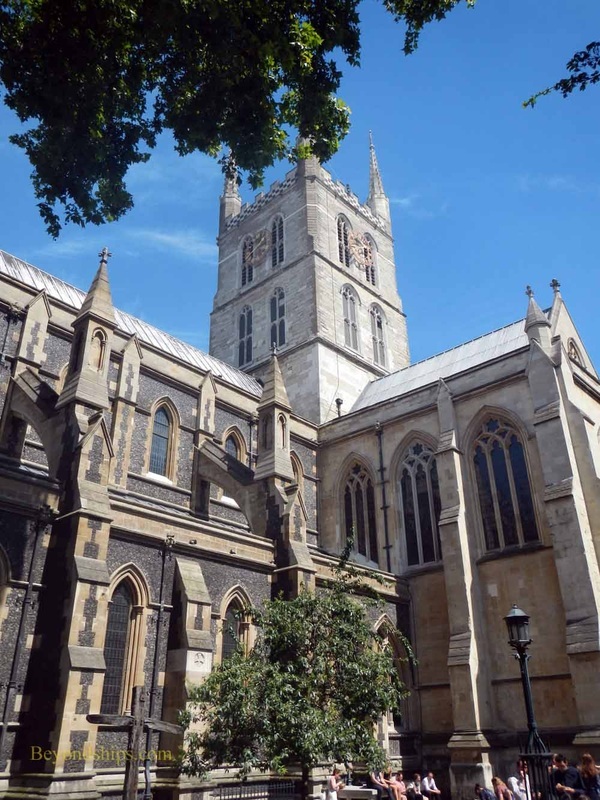 However, one oasis of calm is Southwark Cathedral, not far from the Golden Hinde II. There has been a religious building on this site for at least 1400 years. According to tradition, a nunnery was established here in 606. Since then, fires and political changes have caused the buildings on the site to go through a number of transformations, the last being a change from being a parish church to being a cathedral in 1905. 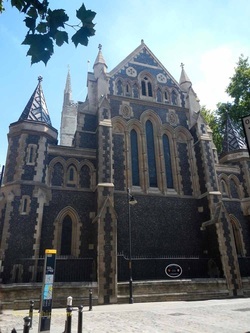 Southwark was not a place of worship frequented by kings and nobles. The south bank of the Thames was not where they lived. Consequently, Southwark served more ordinary people. With several theaters nearby, it was often used by playwrights and actors. William Shakespeare's brother is buried here and there is a memorial to the bard himself. The son of a local merchant, John Harvard was baptized here and a chapel in his memory has been erected by alumni of the university that he founded in Massachusetts. This is not to say that the building is plain or unimpressive. The present building dates from 1220. However, the nave was substantially rebuilt in the 19th century in the Gothic style. Inside, it is a soaring structure with light provided by a series of pretty stained glass windows. Some of these are recreations made after the originals were destroyed in the Blitz. The churchyard is a peaceful area and on nice days, it is not unusual to see people from the nearby buildings sitting there. If you look up in one direction, you see the tower of the cathedral. Look in another and you see the London Shard. Admission to the cathedral is free. However, this is a place of worship and visits are subject to the religious services. For more information, see the Southwark Cathedral website. 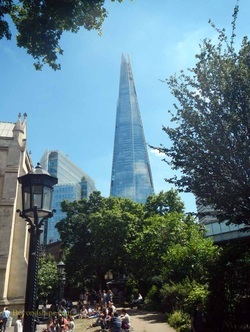 Nearby Southwark Cathedral is the southern end of London Bridge. It is not a particularly impressive-looking bridge but inasmuch as it is sung about by children the world over, it is worth noting its presence. The first bridge on this site was built by the Romans. It was destroyed and rebuilt several times during the early Middle Ages. Then in 1176, a new bridge with 19 stone arches was begun by King Henry II. 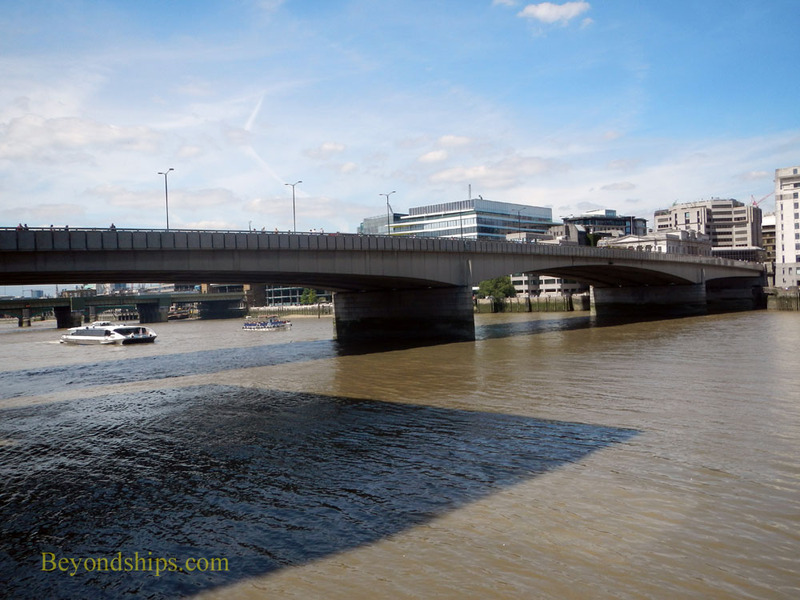 Not only did this bridge provide a path across the river but it carried residential and commercial buildings as well as a chapel dedicated to St. Thomas Becket, who Henry repented having had murdered. By Tudor times, there were 200 buildings on the bridge, some rising seven stories. One of the more grisly practices of this time was to mount the heads of people who had been beheaded on spikes along the bridge. These included the heads of Scottish rebel William Wallace and the ”Man For All Seasons” Sir Thomas Moore. From time to time, the buildings on this congested bridge would collapse or burn down, thus the nursery rhyme. Nonetheless, the medieval bridge continued in use until the 19th century when it was replaced by a bridge with five arches. In the mid-20th century, it was decided that the bridge again needed replacement. But rather than demolish it, the local government put it up for sale. An American businessman, Robert McCulloch purchased the bridge and had it transported to Lake Havasu City, Arizona, where it sits today. The story that McCulloch thought he was buying the much more impressive Tower Bridge (see below) is probably apocryphal. The current London Bridge was opened in 1973 by Queen Elizabeth II. 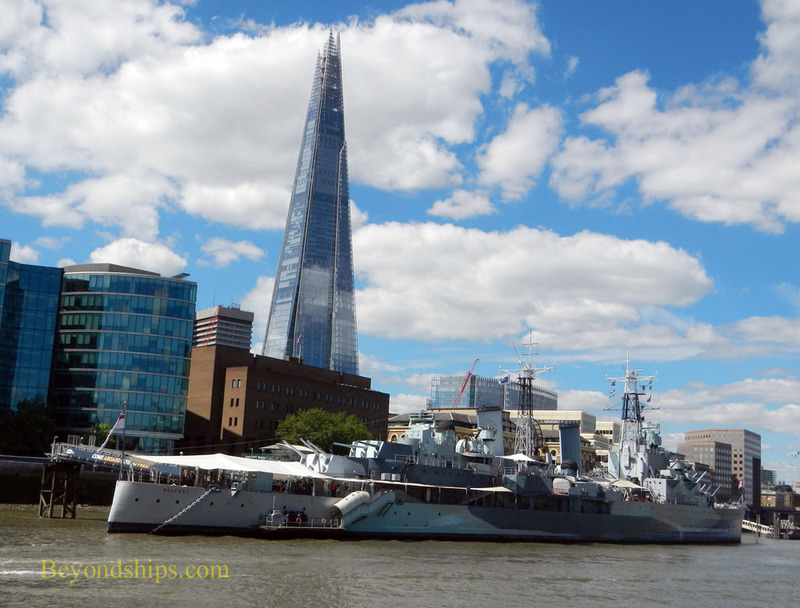 Walking eastward from London Bridge along The Queen's Walk, you see a large warship moored in the river. 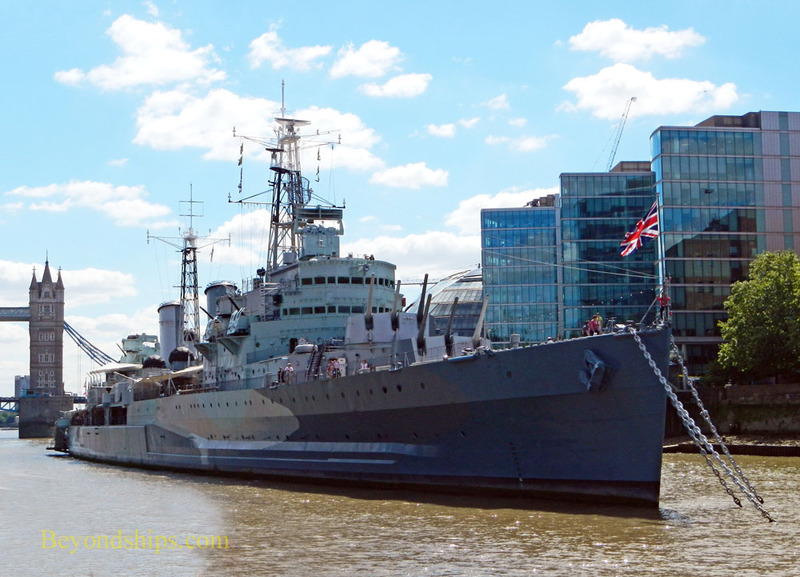 This is the World War II era cruiser HMS Belfast. The ship has been well-preserved and is open to visitors. (See separate article). At the end of this walk is Tower Bridge, a classic symbol of London. 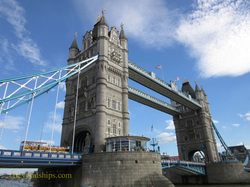 Although Tower Bridge has a medieval look, it only dates from the late 19th century. The area east of London Bridge had grown and with it the need for a Thames crossing that would conveniently serve this area. 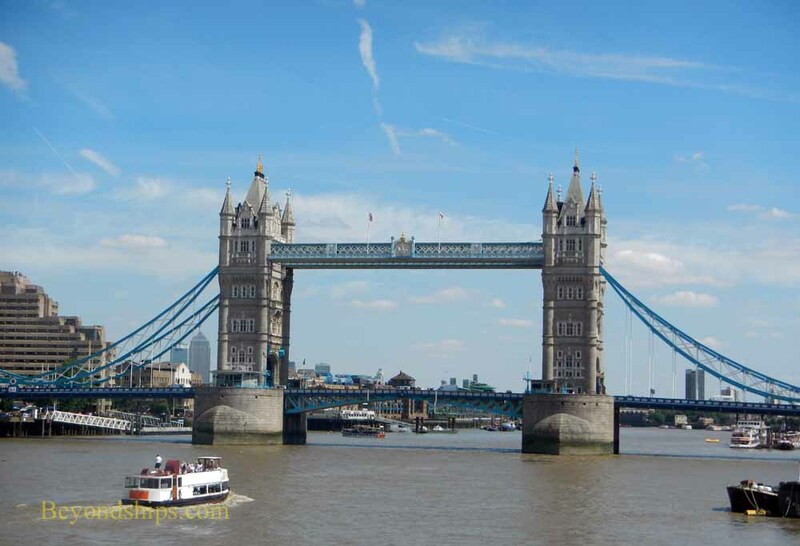 However, because this area was still a busy seaport, a conventional bridge like London bridge would not do because such a bridge would block tall masted ships from proceeding into the Pool of London. A committee was established and it examined some 50 proposals for a new bridge. In 1884, it selected a design by Sir Horace Jones, who also happened to be one of the judges. His plan called for the bridge to have three sections - - a bascule (draw bridge) in the center flanked by suspension bridges on either side. The center section is framed by two towers, each 213 feet high, resting on concrete pillars. Between them is a span of 200 feet which is crossed by two sections of roadway. When a ship wants to go through, the two sections of roadway can be raised 86 degrees to allow the ship to go through. Although river traffic has diminished considerably since the bridge was opened in 1894, the center section is still opened about 1,000 times a year. Also connecting the two towers are two elevated walkways. These were envisioned as a means for pedestrians to cross the bridge even when the roadways were in the open position. However, the only way to access the walkways was by stairs and this proved unpopular. As a result, the walkways became notorious hangouts for prostitutes and thieves. They were closed in 1910. Today, you can walk as well as ride across the roadway. In addition, you can visit the Tower Bridge Exhibition, which tells the story of the bridge. Visitors can see the Victorian steam engines that once powered the bridge. In addition, the walkways, now fully enclosed, are again open to visitors and provide a panoramic view over the city. There is an admission charge for the Tower Bridge Exhibition. Tickets can be purchased at the ticket office or online. For more information, see the Tower Bridge website.